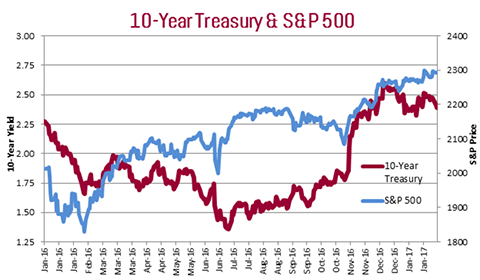 This chart demonstrates the volatility of the 10 year U. S. treasury bond since the beginning of 2016. Will long term bond yields increase as the Federal Reserve Bank increases its overnight lending bank rate? Should one invest in bonds now or wait until rates rise further? What is a proper equity/bond asset allocation given this volatility? These are pertinent questions and are often posed to our Investment Specialists and Portfolio Managers during the course of a week. The matter at hand of this writing is to share our thoughts with you regarding such inquiries. We start by describing the role we serve. We are bond specialists and focus our efforts and skills accordingly in order to help our clients and their counsellors. We manage the “mattress money” portion of our clients’ fixed income investment portfolios. Safety of principal is our primary concern; we rely heavily on our in-house municipal bond credit team to assess issuer credit quality and liquidity. Net after–tax income generation is a very important goal; we are less concerned with short term unrealized paper gains or losses. We believe an actively managed, value oriented, tactical ladder outperforms comparable market averages and helps to accomplish #3 and #4. We have learned over several decades of experience that it is impossible to REGULARLY predict the movement of Federal Reserve Bank controlled interest rates and the larger bond market reaction to such Fed moves. We, like others, have our opinions, but we understand there is a significant difference between opinion and fact. There are no facts regarding future events, only opinions, and we believe it is a fool’s errand to attempt to predict these events consistently over long periods of time. The persistent state of low rates over the last five or six years proves the point. How many pundits, how many times predicted higher bond yields over the last five to six years? We believe you must play the hand you are dealt, instead of frequently folding to wait for a better day. Our “tactical ladder” bond portfolio strategy is a measured strategy and a conservative approach to today’s low growth/low rate environment. Our approach avoids taking bold actions based on forecasts of uncertain future events (opinions). We believe this approach is imprudent for clients’ “mattress money” capital. Instead, we focus, on uncovering value for client portfolios based on our municipal credit analysis (facts) and our market expertise about bond pricing (facts). We are keenly aware of what we DON’T know and our strategy, therefore, is focused on what we understand. Our litmus test for determining the success of a portfolio strategy is if it produces the desired results. Early in my career attempting to provide a satisfactory answer to the third question above (asset allocation) was a vexing issue for me. That changed many years ago. I will share some advice I received directly from Jack Bogle, the founder and retired CEO of The Vanguard Group. Many years ago I dined with Jack when he was visiting Chicago. There were just four of us and we spent several hours together talking about his career, the Vanguard Group, Bernardi Securities, the financial markets and industry. It was one of the most fascinating and insightful business meetings of my career. I remember many of the things we discussed that evening including Jack’s answer to my inquiry about an appropriate stock versus bond portfolio mix. He started his answer with many of the usual caveats including a proper allocation depends on the individual’s personality, tolerance for risk and volatility. When I pressed him for a firm percentage he offered this allocation formula: divide your age into 100 to determine the conservative (bond) allocation. As an example, if one is 60 years old, then according to this formula an appropriate bond allocation is 60%. The remaining percentage needed to equal 100%, 40% in this example, represents the appropriate growth (equity) allocation. He acknowledged it as a simple approach. He told us the formula had worked well for him and others over the decades. Most importantly he stressed, it helps ensure that as an investor ages the portfolio becomes more conservative. He ended the topic by saying that whatever formula is applied, stick to it. Simple and sage advice, in our view. Certainly, not appropriate for all, but definitely worth considering in these turbulent times. We hope this writing is helpful and thought provoking. Please call us if you care to discuss and we thank you for your continued confidence.